During my hiking adventure in Scotland I camped almost all the time. But I understand that it is not for everyone. If you would rather find something with a proper bed and private bathroom, click on the map below to see what you can find through booking.com. Note: the map leads to an affiliate link, which means that if you book through it, I receive a modest commission. Thank you for your support. If you can’t see the map below, try refreshing the page. Thanks! During my month-long hiking adventure in the Scottish Highlands, I was almost only sleeping in my tent - either wild camping or on a camping site, only a few times sleeping in a bothy. Scotland is the perfect destination for a budget travel. It has very liberal laws regarding wild camping, but there are, of course, limitations. Make sure you research them and learn how to camp leaving no trace. There are areas (in National Parks and such) where camping might be forbidden outside of designated camping areas. Below are the places I stopped at and some I know about that might be useful. There is also a plethora of B&B and hotel accommodation if that's your style - just make sure you book them well in advance. When I was hiking I saw only signs announcing they had no openings. The good thing is if you are a hiker/walker a camping site can't turn you away if there is no other one near (they can do that for driving tourists). It is also good to know that thanks to West Highland Way's popularity there is a number of luggage transport services. They will take your big bag to the next campsite or B&B while you hike the trail with just a light day pack. This is a wonderful service, although I did not use it, I've seen a lot of positive opinions and recommendations. 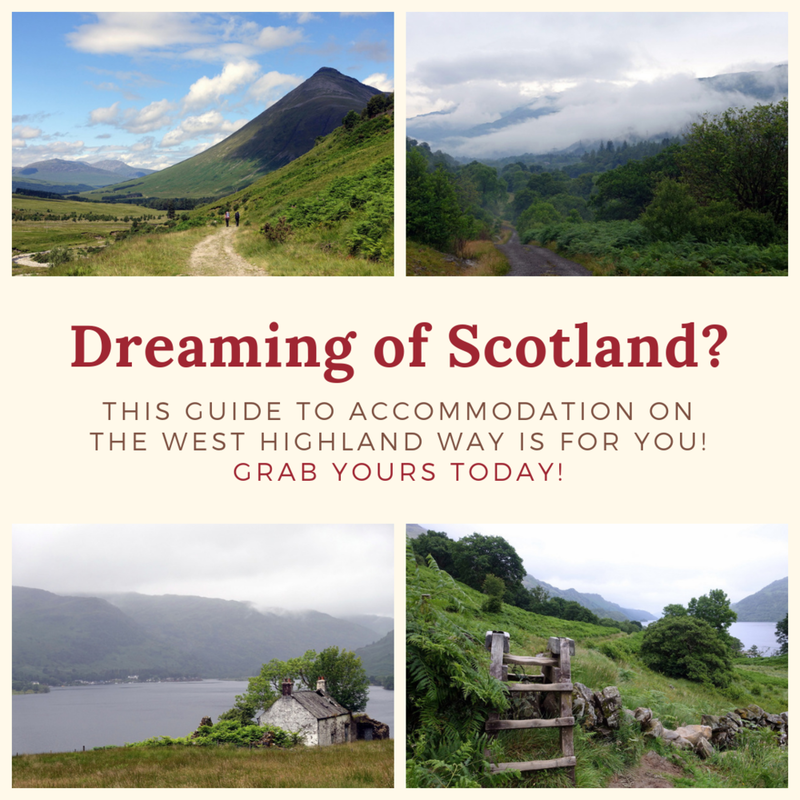 Sign up for my Newsletter and receive the handy Guide to camping on the West Highland Way! Sign up with your email address to receive the Guide to WHW. I'm going for an adventure! Thank you for subscribing to A Woman Afoot! Looking for ideas for budget camping along the Great Glen Way? You are in the right place! The Great Glen Way is a 117 km long coast to coast path through the Highlands. The route follows the natural fault line of the Great Glen. It takes you along the whole lengths of Loch Lochy, Loch Oich and Loch Ness as well as the Caledonian Canal that links them. Most of it runs on low levels with just some recently added options taking you higher. It is considered an introductory trail to the Highlands and to the long-distance trekking. It is also the perfect trail for solo and budget hiking – it is very well marked, safe and with enough places to camp overnight. 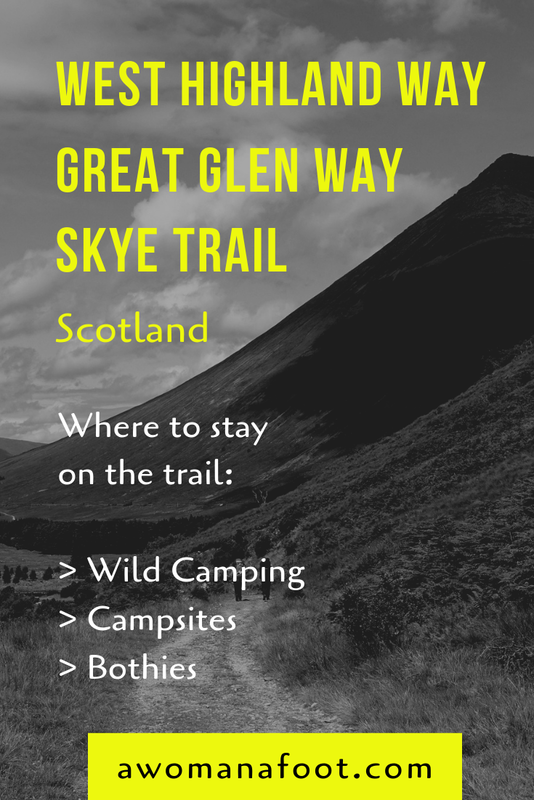 The Great Glen Way is much less popular than the West Highland Way, which means you meet fewer hikers on your way and also - that there are fewer accommodation options. The good thing is, the Canal is very popular with kayakers and some facilities designed for their needs can be used also by hikers. An example would be (highly recommended by me) renting a key to facilities run by the Canal Office. It costs £10 and have an access to a number of compost WCs and showers along the Canal. There aren't many opportunities to stop at a pub or a restaurant to use their bathrooms, so renting this key is a serious help. 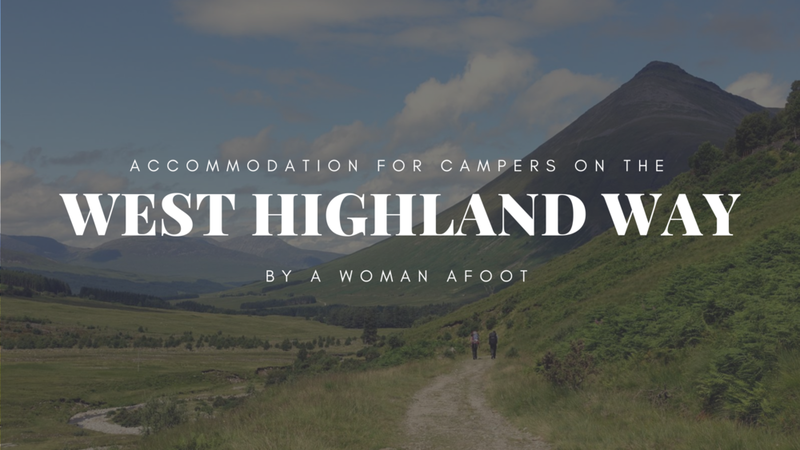 Below is the list of places I camped at and a few other options you might have - especially that I cut my hiking short at Fort Augustus to move onto Isle of Skye. Dedicated wild camping area, no facilities. There is room for just a few tents, a picnic table and a beautiful view to Moy Swing Bridge... but not much more. The grass was cut short and well taken care off. It's clean, nice and free, but basic. If you choose to move past Moy Bridge you can find some B&B accommodation in Gairlochy, or go about a 1 km off the trail to a campsite. In Gairlochy there is also a spot with shower facilities - they are big, clean and with hot water so I was really happy with the combination of wild camping at Moy Bridge and then walking just a bit to showers in Gairlochy. This is a dedicated wild camping spot on your way to Laggan. There is a small path leading off the main Great Glen Trail. It's a really tiny spot - for maybe two tents, but it's lovely. There is also a compost WC. It's clean and it doesn't smell! And you need the Canal Office key to access it. The views in the morning are incredible... There is nothing like drinking coffee with such a background! Another designated wild camping area. This one also has a compost WC, but I was out of luck when there - it was closed for maintenance. I hope by now they fixed whatever had to be fixed. The camping area is hidden a bit in the forest but I camped closer to the canal bank unknowingly. Another beautiful spot! It is right next to he lock keeper's house who keeps an eye on everything. There is a camping site a bit off the trail called Inver Coille. Check their site for more details. If you choose the lower path you can stop at the designated wild camping area in Alltsigh. At the end of the Great Glen Way you reach Inverness where you can find more option for accommodation. For the budget and camping minded folks you can stop at Bught Caravan and Camping Site. It's pretty close to the town's center and offers wide range of facilities, £10 for a solo camper. Do you have all you need for your Scottish adventure? Check with this complete hiking and camping in Scotland packing list for women to make sure you have all you need! Make sure you are prepared for the hiking adventure in Scotland - take a look below at some high-quality gear to pack! I'm sure you have heard about the stunning beauty of the Isle of Skye. Hiking and camping along the Skye Trail is the best way to experience its striking awesomeness. The Skye Trail takes you from the most northern tip of Skye - Rubha Hunish, through the unbelievable Trotternish Ridge with the famous Old Man of Storr rock, passing close to Cuillin and ending in Broadford, almost 130 km later. It can be done in about 7 - 9, depending on hiking style and fitness levels. This trail is for experienced hikers. You have to have a map and compass on you - there is some markings on the way, but not always clear and it is not difficult to get lost when weather turns sour. Although wild camping is available (legally) it is not always possible thanks to the unique Scottish moors. You might look at a picture and think that there are miles and miles of perfect green grass to pitch your tent on. But when you get closer you realize it's all boggy and covered in water (sometimes pretty deep). That's why don't just assume you can pitch anywhere on the way and make yourself familiar with the camping options along the way. During my month-long hiking adventure in the Scottish Highlands, I was sleeping almost only in my tent – either wild camping or on a camping site, only a few times sleeping in a bothy. Scotland is the perfect destination for a budget travel. It has very liberal laws regarding wild camping, but there are, of course, limitations. Make sure you research them and learn how to camp leaving no trace. There are areas (in National Parks and such) where camping might be forbidden outside of designated camping areas. Below are the places I stopped at and some I know about that might be useful. There are also some B&B and hotel accommodation in shorter or farther distance from the Skye Trail, but not as common as in other parts of Scotland. Make sure you research and book them well in advance. The good thing is, if you are a hiker/walker a camping site can’t turn you away if there is no other one near (they can do that for drivers). I hiked the trail north to south and that's how I will describe it. Some people come to Duntulm early in the morning and walk to Flodigarry without any stops, but I chose to come to Duntulm in the afternoon and walk to the Lookout both for the night. I can highly recommend this idea, as you may have more time to explore RubhaHunish (a must!) or go earlier on the Duntulm castle. The Lookout is a tiny wooden house which used to be a coastguard watch station. Today it is maintained by the MBA – click on to learn more and/or support them. It's made for three people (two at a lower bunk and one on the top, but when I was there all together five people could fit in, sleeping on the floor. There are no facilities and bring your own water. I absolutely loved the Flodigarry Hostel! They have a camping site next to the hostel and you can use all their facilities. Which means fully-equipped kitchen, warm and big dining room and even a tea room for a cozy evening with a book! This is luxury for a hiker! TIP! The hostel is closed until 5pm. If you have no place to go, you can either sit in front of it at tables and look at this stunning view or go for a tea to the Flodigarry hotel nearby. Now we have a problem. The stretch between Flodigarry hostel and Old Man of Storr (to get to Portree campsite or wild camp somewhere there) is a very long stage: almost 30km (and then getting to the campsite!). If you are really good you might do it, I wasn't even thinking of it, so the only other option was to wild camp atop the Ridge. In a beautiful weather it's not a problem, although you might walk a bit to find the least boggy spot. I was unlucky to camp there in a really nasty weather and was worried it would blow me off the cliff ;-) The winds there are powerful and the trail is completely exposed. Be warned! It might not be your thing. TIP! One way to do it is to leave your stuff at the Flodigarry campsite, grab only your day pack and go early by bus to the Old Man of Storr and walk this stage backwards. Then again take a bus to start again from the Old Man of Storr south. That's what I will do the next time I'm there. A very nice campsite just outside of Portree. It takes about 30min to walk there from its center. You don't have to stop here, the official end of this stage is in Elgol. But I highly recommend it - there is a new bothy there with a lot of room. As a bothy it does not have any facilities, but is spacious and recently built with good isolation - so also nice and warm-ish. There is one social room for meals prep and eating, and one sleeping room with two levels of wooden platforms. If there is suddenly a lot of tourists - there is still floor to be used! As far as I know there is no campsite or other accommodation in Elgol - only wild camping (another reason why it's worth to stop at Camasunary Bay). There is a B&B in Torrin, but no campsite. It is suggested to wild camp before you reach the village. Later you may want to stop by the famous Blue Shed Cafe (open April - October and on weekends in the winter months). There is also a stop for the Elgol - Broadford bus. As I was cutting my trail short for the lack of time, I utilized this opportunity. If you are not trying to do this stage in one day (20 km) your only option is wild camping. But don't worry - this area is beautiful and has enough great spots to pitch your tent. There is no official campsite in Broadford, but there is a Youth Hostel, hotel and some B&B. Knowing it, I stopped some 4 km before the village for a last wild camp. A guy I met there was able to camp at the Youth Hostel - he simply went and asked if he could. I don't know if it's a regular practice (there is nothing about it on their site) or if it was just a one-time mercy thing. In Broadford, you will find a bank, big co-op store, pubs and a bus stop. TIP! If you plan on getting from Broadford directly to Glasgow Airport, book your bus ticket in advance (online by yourself or you can buy it in any Tourist Office) - when I was going back there was no seats left and people were turned away! I was so glad I got my ticket the day before!